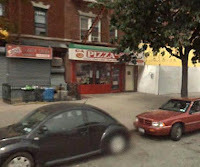 Kensington, Brooklyn: G&A Pizza exists, is for sale. We came across this Craigslist posting today and were startled to discover that there's a pizza place called G&A here and that it's apparently available for purchase. Looking back a couple months to the Pizza iteration of Restaurant Wars, I see that only one person brought it up in the comments area. Congratulations, Alicia. Unfortunately we also have to inform you that your favorite pizza place isn't sticking around. Anyway, if you don't feel like clicking, here's the essentials: G&A Pizza is on Fort Hamilton Pkwy, across the street from IHM. 60K gets you the joint and you're supposed to call a man named Eric about it. Don't be alarmed if he picks up the phone and just starts screaming uncontrollably, because apparently he doesn't believe in spaces or lower case letters and this habit might carry into his verbal communication as well.